In 2015, Americans alone spent over $11 billion on teeth whitening, including over $1.4 billion on at-home whitening products (1). The practice involves swishing oil around in your mouth to remove bacteria, which can turn into plaque and cause your teeth to look yellow (2). Coconut oil is also high in lauric acid, which is known for its ability to reduce inflammation and kill bacteria (3, 4, 5, 6). A few studies have shown that daily oil pulling effectively reduces bacteria in the mouth, along with plaque and gingivitis (3, 7, 8). Streptococcus mutans is one of the primary types of bacteria in the mouth that cause plaque and gingivitis. One study found that daily swishing with sesame oil significantly reduced streptococcus mutans in saliva in as little as one week (8). 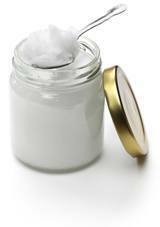 Bottom Line: Coconut oil pulling involves swishing oil in your mouth for 15–20 minutes to remove bacteria. Practicing this daily can reduce plaque and may brighten your teeth. Additionally, baking soda creates an alkaline environment in your mouth, which prevents bacteria from growing (9). One study found that toothpastes containing baking soda were significantly more effective at removing yellow stains from teeth than standard toothpastes without baking soda. The higher the concentration of baking soda, the greater the effect (10). Furthermore, a review of five studies found that toothpastes containing baking soda removed plaque from teeth more effectively than non-baking soda toothpastes (11). Bottom Line: Brushing with a paste made with baking soda and water can reduce bacteria in your mouth and buff away surface stains. Hydrogen peroxide is a natural bleaching agent that also kills bacteria in your mouth (12). One study found that a toothpaste containing baking soda and 1% hydrogen peroxide led to significantly whiter teeth (13). Another study found that brushing with a commercial toothpaste containing baking soda and peroxide twice per day led to 62% whiter teeth in six weeks (14). While heavily diluted concentrations appear safe, strong concentrations or overuse can cause gum irritation and tooth sensitivity. There’s also concern that high doses may cause cancer, but this has not been proven (15, 16, 17, 18, 19). Bottom Line: Hydrogen peroxide is a natural bleaching agent and can kill bacteria in your mouth. You can use it as a mouthwash or mix it with baking soda to form a whitening toothpaste. Acetic acid, which is the main active ingredient in apple cider vinegar, effectively kills bacteria. The antibacterial property of vinegar is what makes it useful for cleaning your mouth and whitening your teeth (20, 21, 22, 23). One study performed on cow teeth found that apple cider vinegar does have a bleaching effect on teeth. However, they also found that vinegar may soften the teeth (24). The acetic acid in vinegar has the potential to erode the enamel on your teeth. For this reason, you should not use apple cider vinegar every day. You should also limit the amount of time that apple cider vinegar is in contact with your teeth (25). Bottom Line: Apple cider vinegar has antibacterial properties that may help whiten your teeth. However, overuse of vinegar can also erode the enamel on your teeth, so limit its use to a few times per week. 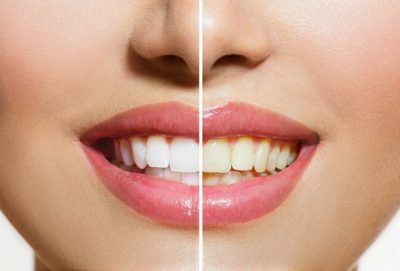 A recent study found that a strawberry and baking soda mixture produced very little color change in teeth, compared to commercial whitening products (26). Despite studies showing that a strawberry and baking soda paste had a minimal effect on tooth enamel, excessive use could cause damage (27, 28). A study found that a toothpaste containing bromelain, an enzyme found in pineapples, was significantly more effective at removing tooth stains than a standard toothpaste (29). Bottom Line: Certain fruits may have properties that help whiten teeth. Regularly consume raw fruits and vegetables to help rub off plaque and keep your teeth looking bright. Coffee, red wine, soda and dark berries are infamous for staining teeth. That doesn’t mean you have to completely avoid them, but you should limit the amount of time these substances are in contact with your teeth. If you want whiter teeth, cut back on your sugar intake. 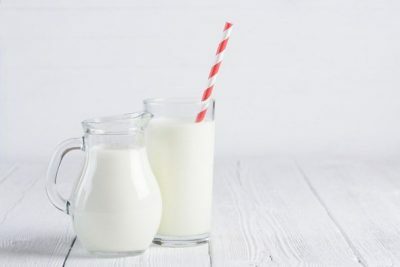 A diet high in sugar supports the growth of Streptococcus mutans bacteria, the primary type of bacteria that causes plaque and gingivitis (30, 31). Calcium-rich foods, such as milk, cheese and broccoli, may help protect your teeth from enamel erosion (32). Bottom Line: A healthy diet with enough calcium can help prevent your teeth from becoming yellow. Brushing your teeth soon after you eat can also help prevent stains. While some tooth discoloration comes naturally with age, a large portion is a result of plaque build-up. Bottom Line: Daily brushing and flossing, along with regular cleanings at the dentist’s office, prevent the build-up of yellowing plaque on your teeth. There are a few other natural teeth whitening methods, but there is no scientific evidence to prove that they are effective or safe. Activated charcoal: Brushing with powdered charcoal supposedly pulls toxins from the mouth and removes stains from teeth. Kaolin clay: Proponents of this method claim that brushing with clay helps remove stains from teeth. Fruit peels: Rubbing orange, lemon or banana peels on your teeth is claimed to make them whiter. Advocates of these methods claim they make teeth significantly whiter, but no studies have evaluated their effectiveness. This also means that they have not been tested for side effects when used on teeth. Bottom Line: Activated charcoal, kaolin clay and fruit peels may help whiten your teeth, but no studies have evaluated the safety or effectiveness of these methods. There are several natural methods to help whiten your teeth. Most of these remedies work by gently removing surface stains on your teeth.